Comments Urgently Needed To Save Orcas And Oceans! Your Comments Needed for Southern Resident Orca Task Force Meeting! Our full response to Governor’s Inslee Orca Task Force: “It is Black and White: No More Compromises! Keep the SRKWs Alive!” will be completed soon. It covers issues that may not be addressed by the Governor’s Task Force. 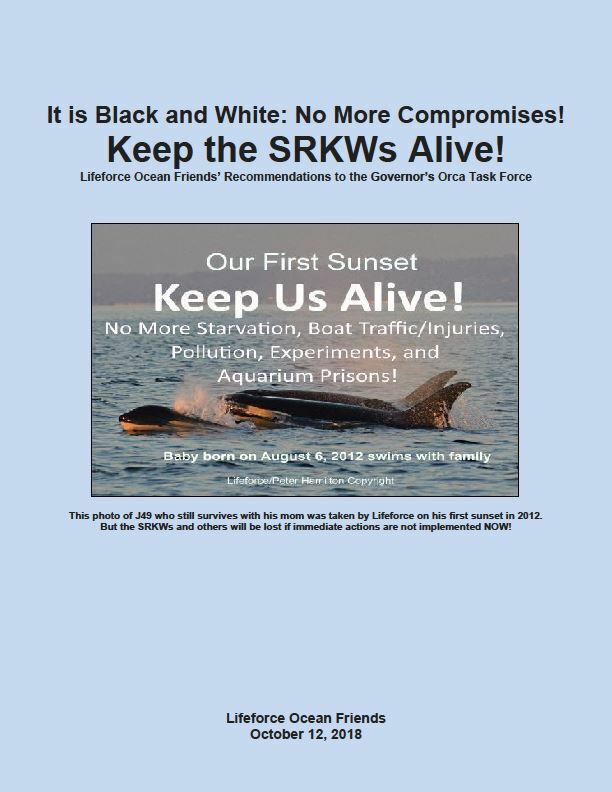 This report includes the 10 recommendations that are summarized at Ocean Friends Facebook to help the SRKWs and others. The next meeting of the Southern Resident Orca Task Force will take place on Wednesday, October 17and Thursday, October 18. The full agenda will be posted on the Task Force website. If their schedule allows, TVW, Washington's public affairs network, will broadcast the plenary portions of the meeting. The broadcast will be available afterward in the TVW archives. Please check the TVW website for more information. Public comments continues to be accepted in writing in a more simple form. Go to Lifeforce Ocean Friends Recommendations and link to Public Comments at OCEAN FRIENDS. Lifeforce has been fighting to save these orcas from extinction since 1993. You can contribute to protecting these orcas by signing and sharing the petition and through making a donation to Lifeforce Foundation through Paypal. DONATE HERE.